What does movement have to do with a sprained wrist? Dealing with a sprained wrist can be quite the painful and uncomfortable experience. You may be an active person who likes to play sports, or someone who has a busy work life and can’t afford to take that much time off from your job. If you're reading this article, then there's a good chance that you or someone you know are looking to heal a sprained wrist fast. There’s a lot of conjecture and speculation out there regarding the healing process and timeline for a sprained wrist, which can make it difficult to know what is and isn't helpful information. In this article, we are going to provide some general tips you can follow to help understand how long it will take to heal a sprained wrist as quickly as possible. Before we begin, one thing we would like to point out is that the exact timeline for injury recovery, as well as the treatment involved, will depend on the nature of your specific injury. For this reason, we always recommend visiting a physician or physiotherapist to discuss your particular injury, and what ways may be best to facilitate a speedy recovery. In the mean time, here is some general information. 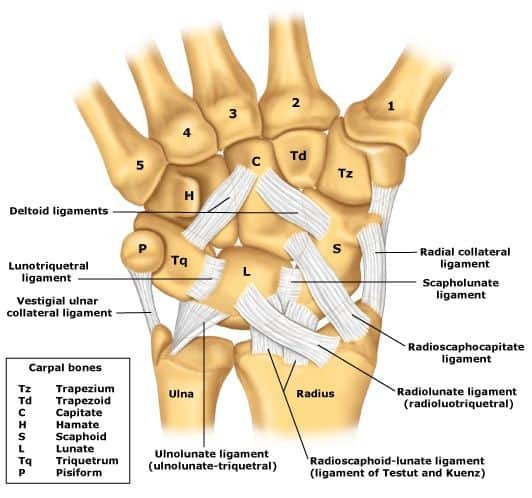 The anatomy of the wrist joint is surprisingly complex and consists of numerous smaller articulations (i.e. joints). Having numerous joints to form a joint complex allows us to flex and extend our wrists as much as possible while still providing some stability, and other movements like radial and ulnar deviation (or abduction and adduction, respectively) allow even more movement of the wrist, allowing us to have a wide range of positions to choose from, which we mostly do subconsciously. When it comes to a sprained wrist, the symptoms can potentially be quite easy to understand to the point where you can be highly suspicious of a wrist sprain. It’s likely you will feel a strong pain in your affected wrist as well as some swelling initially that will turn into tenderness for the next few weeks. Tenderness to the touch can be present in certain situations, but generally speaking, trying to move the wrist will likely be the most challenging and painful. So we talked a little bit about how the wrist allows for lots of movement, and also how symptoms of a sprained wrist generally hinder movement both in terms of stiffness and pain. So what's the connecting factor? That answer lies in the ligaments that surround the wrist. When you see the word "sprain" (not strain), and assuming it is being used correctly, this refers to damage to a ligament or multiple ligaments. On the other hand, the word "strain" (with a 't') refers to damage to a muscle. So when you sprain your wrist, or ankle, or any other joint in the body, you are damaging the ligaments that surround that joint. Ligaments are like elastic bands. They are tight enough that when they span over a joint they offer some additional stability, but if they stretch too much, they can be taken beyond the amount they are able to stretch, resulting in micro-tears, a partial tear, or complete rupture. These are passive structures, meaning you don't have voluntary control over them like you do with muscles. So if you picture an ankle sprain, which is often what people can visualize the easiest due to previous experience with an ankle sprain, it can be easy to see why rolling your ankle can lead to a sprain. In this case, by rolling your ankle in the way that your toes and sole of the foot are pointing inwards (inversion), you are lengthening the outside portion of your foot. This stretches the ligaments on the outside of the foot, and if they are stretched too much too quickly, the result is a sprained ankle. The wrist is basically the upper body's version of the ankle. It also has numerous ligaments surrounding the joint, but even though your wrist doesn't support your body weight like the ankle does, it can still be prone to injury. The natural human reaction to falling is to put your arms out to catch your fall. This is a common cause of wrist sprains, as well as hand and wrist fractures. Additionally, sports and other activities or tasks that involve using the hands a lot (especially if you need to exert a lot of force/strength) can be common activities for wrist sprains. Here is a brief explanation of a sprained wrist from a hand and wrist surgeon at the Mayo Clinic. In this brief video, Dr. Kakar gives a nice explanation of the wrist and wrist sprains, and provides his thoughts on treating a sprain. This is a tricky concept due to one main factor that holds true for any soft tissue injury: Biological tissue has a natural healing rate. This means you can't really "speed up" the natural healing process, at least not in a practical sense. However, by providing a conducive environment for the tissue to heal as fast as possible is usually a worthwhile endeavour. So what can you do to help optimize your recovery? The RICE protocol is one of the most simple and reliable ways to promote a positive healing environment. There are numerous variations that you can try out as well, whereby these variations begin incorporating some additional elements as well. In any case, RICE is always a component to these protocols, so it serves as the foundation. So what does RICE stand for? This is fairly obvious. If your wrist really hurts and is extremely difficult to move, chances are you shouldn't move it. That said, it's important that you don't get carried away and immobilize it for extended periods of time. Getting back to proper movement as soon as you are capable of it is important in order to maintain muscle tone and flexibility within the joint. This specific timeline will need to be assessed by your physician, surgeon, or physiotherapist. While not technically part of rest, we also suggest protecting the joint. This can be something as simple as wrapping some padding around your wrist so you don't bang it off anything. Even further, wrist braces are becoming increasingly popular now, and these can help maximize the function of your hand while still keeping the wrist joint in a neutral and comfortable position. Ice is known to help reduce swelling, which is caused by inflammation in the joint. While there is some debate that ice can actually slow down some of the mechanisms involved in the natural healing process at the cellular level, the general consensus is that the advantages far outweigh the disadvantages. Have something between your skin and the ice, for example, a cloth, shirt, or towel. As you ice your wrist and time goes by, the skin will gradually become increasingly numb, so you could be unaware if you are icing it too much if you don't have anything between the ice and your skin. Benefits extend beyond the period the period that you are actually applying the ice. So if you don't see a noticeable drop in swelling immediately, don't worry, you're still helping yourself out. According to the American Academy of Orthopaedic Surgeons, ice should be applied for 20 minutes at a time. You can do this multiple times over the course of a day or even a few hours, just make sure to take a break in between. Compression needs to be practiced with caution, as you don't want to place too much stress on the wrist. A simple elastic bandage can be a suitable method of compression, and these can be found at most pharmacies at a relatively affordable price. If you're using a bandage, make sure you can feel the compression, but that it doesn't hurt or cut off the circulation. Furthermore, make sure you have your wrist in a neutral position. Some wrist braces also provide compression, and while they are a bit more expensive, they also tend to be a little more durable and supportive as well. Some people find the compression helps to alleviate the pain, but again, this can be a little tricky. In cases like carpal tunnel syndrome, a reduction in pain doesn't necessarily mean the issue is being fixed, it's just relieving a symptom temporarily. In the case of a sprained wrist, decreased pain is definitely a good sign, but just keep in mind that the main goal is to provide a conducive environment for healing. This one might seem a little weird, but elevating the injured wrist to a level above the heart will help with venous return (sending blood back to the heart) and can even help reduce swelling. Venous return is important because that's an essential component of circulation, which is key in the healing process. As your body is healing the injured wrist, it digs up waste products and lays down brand new tissue, so this waste needs to be removed eventually, while still bringing fresh new material to the site. You can consider circulation as the conveyer belt of the assembly line, making it essential to actually healing the wrist. We mentioned this briefly a couple times throughout the article, but it really is of upmost importance, especially if your wrist injury was a result of a fairly serious fall. Only a doctor or a health care professional that they refer you to can provide a firm diagnosis. Essentially, you want to confirm that it isn't a fracture or that surgery is a necessary step. This will also help you cater your treatment to your specific needs. For example, if you benefit from physiotherapy, then this will definitely help get you back to 100% as soon as possible. You can also receive guidance about reducing the pain, as well as precautions and dosage information about more accessible over-the-counter pain medications and anti-inflammatories, such as Tylenol and Advil. Lastly, if you are referred to a physiotherapist and they prescribe some exercises for you to do at home, do your best to keep up with them! Sometimes they can seem repetitive and boring, but their guidance is always evidence-based and they are well-versed in injuries like these. Keeping up with the exercises will help ensure you regain as much of your mobility as possible and in a timely manner, and it's also important in order to avoid re-injury down the road. While the timeframe for your recovery will depend on the exact injury and how you treat it, you can expect a timetable of anywhere between a few days and a few months. It's commonly a multi-week process to get back to normal, but if the sprain is really mild and you follow the RICE protocol, chances are you can reduce that timeframe. On the other hand, if you experience a setback, or if it's a more severe injury, for example on that required surgery, then your timeframe for recovery will be much longer. At the end of the day, seeking the proper medical advice in person from a doctor or other professional, as well as being diligent with your treatment, are the two biggest things you can do to heal your wrist sprain as quickly as possible. Try and stay positive, and hopefully you'll be back to normal before you know it!